The Department of Work and Pensions have today announced that they will hold a “further consultation on the mobility component of Personal Independence Payment (PIP)”. This follows the outcry after the threshold to be eligible for the most help with moving around was tightened from fifty metres to twenty metres with no indication during the consultation that this would be the case. Myself and two others had initiated a Judicial Review against the DWP to declare the consultation invalid and force a rethink. The Judicial Review would have taken place at the end of July. The DWP would very much like you to believe that it is holding this new consultation because it is a kind and listening department and their announcement does not mention the court proceedings at all. However the emails sent out to my solicitor and to members of the stakeholder consultation forum had a subject line of “Re: Judicial Review” so make of that what you will. While this new consultation is very good news it is not an admission that the twenty metre eligibility is wrong or an indication that the DWP will change their minds. We will have six weeks to make sure that the DWP has no choice but to admit that the twenty metre limit will cause serious harm to a great deal of people, withdrawing support from people that desperately need it. I will publish details of how to contribute to the consultation once they are available. A lot of credit is due to Jane Young and We Are Spartacus for getting legal action organised to bring about this new consultation. I will be discussing with my solicitor and other people involved what step to take next. The court gave the go ahead on Friday the 3rd of May for the legal challenge against PIP to proceed to a full judicial review. This decision represents a big step in the process as it means that a judge has heard from both my own lawyers and the Department of Work and Pensions and has decided that the case has enough merit to proceed to a full hearing in July. Although the case was initially brought by three people through two different solicitors (Two people in conjunction with We Are Spartacus and one separately) the DWP have convinced the court to put two of the cases on hold and to proceed with only one case. Our lawyers have agreed that my case is the best one to proceed to a full judicial review. Solicitors for the other two cases will be watching my case and will request to rejoin the proceedings should they have something different to add. I receive Disability Living Allowance. 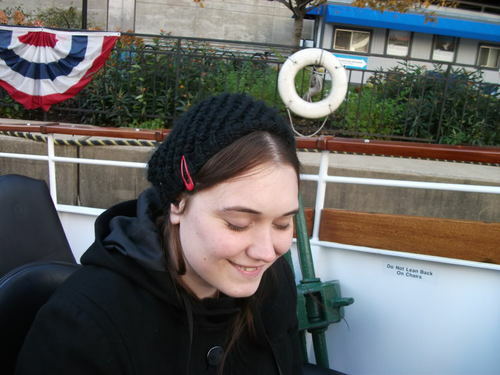 DLA provides help for people who are disabled to live a normal life on a more equal footing. DLA provides two components, care and mobility, that pay for carers, cars, wheelchairs, but also taxi fares, pre-prepared food, adaptations for the home, and many more things. 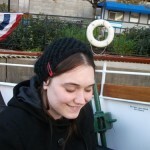 I asked people on Twitter what they use their DLA for and you can read their answers on Storify. The Welfare Reform Act replaces DLA with Personal Independence Payments. Under PIP eligibility for the highest rate of help with mobility has been drastically reduced, from 50 metres to 20 metres and I fall right in the middle of those two. If I do not qualify for the enhanced rate of mobility then the biggest change is that I will no longer be eligible to lease a car from the Motability scheme. That means that I will have to rely on my wheelchair and public transport for every trip to the shops, to the doctor, to the hospital, and that means that every trip will turn into an far longer ordeal of exhaustion and pain that will leave me stuck in bed for hours or days afterwards. It means that I will only go out for the essential trips and will stay isolated the rest of the time and that will affect both my physical and my mental health. DLA is paid to disabled people regardless of whether they work or not, and in fact it enables a lot of people to get to work. If I were ever to return to work then it would be the help from DLA that got me there. Without it, I don’t stand a chance. I am one of three people, likely to be badly affected by the change, that is taking the government to court and asking for a judicial review to declare the consultation invalid. Jane Young of wearespartacus.co.uk did a huge amount of work to start the legal action, finding lawyers to take the case pro bono, finding people willing to put themselves in the firing line and put their name to the case. A call for volunteers was made through blogs and social media (Social media being a lifeline for isolated sick and disabled people) and lawyers picked those with the best case from about 50 volunteers. Although I volunteered early on I was not initially involved until one of the other people withdrew for personal reasons. This meant that I was brought in to the process at a late stage and had to rush through the paperwork. Even with a solicitor doing most of the work I had to work with her over the phone to produce my statement and I had to read and sign an awful lot of pages, each of which had to be emailed, printed, signed, scanned and both posted and emailed back because of time constraints. All very draining stuff for a sick person. Some have criticised us because the legal case focuses on one part of PIP and didn’t cover mental health, among other things. 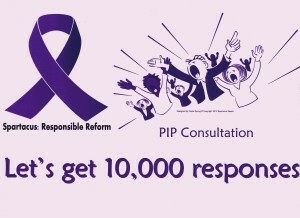 Believe me, if I could have taken the government to task over all the other aspects of PIP I would have done. (Not least because I have mental health problems myself.) As it happens I was in the right place at the right time to take on this particular aspect and so that is what I have done. Unfortunately it isn’t possible to just go to court and tell them that PIP is rubbish, we had to specify exactly how the law was broken and attacking just this one aspect has been a lot of work for the people involved. If we are successful in the judicial review then the consultation will have to start all over again with the 20 metre limit rather than the 50 metres mentioned in the first consultation. However, given the arrogance of the government I see no reason why they would pay attention to a new consultation any more than they paid attention to the one that they already did. I see this judicial review as a tool to give time to shine a spotlight on the injustice of PIP and bring attention to the arrogance of the government rather than the ultimate goal in itself. I think it will be public pressure that will change this policy, and the judicial review could be instrumental in bringing that about. I believe the best result would be if the government dropped PIP and kept DLA. For the official press release and contact details for enquiries please see my announcement about the case. UPDATE: The case was heard on the 9th and 10th of July. 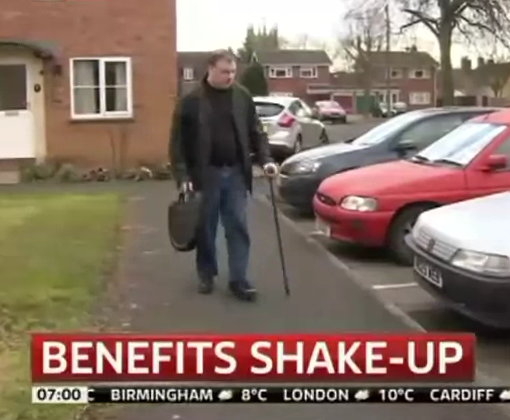 Mainstream media has shown very little interest in covering the coming changes to benefits and the impact that this will have. There is an occasional segment on TV news and a few more newspaper articles but even after two years of campaigning few people realise what is actually happening. The common reaction is disbelief and accusations of scaremongering and exaggeration. My idea is to create an hour long documentary film using all the professional tricks to make it compelling and informative so that it conveys the full impact of the changes hitting people who live on benefits, whether unemployed, disabled or low-income. It would use personal stories, graphics, commentary, interviews and music to tell the story. The film does not have to convey a political message, only the reality of the changes. Any positive changes that can be found should be included too. I believe that even if made as unbiased as possible the film will be devastating in its message. To get mainstream appeal the film could be narrated by and feature interviews with celebrities, with well-known paralympians potentially being the best choice but others too. While a spot on television would be the ideal, these days a film on YouTube can get millions of views – potentially more than would see on TV. An online campaign using very short clips and hashtags could attract viewers. To raise the chances of it being seen on TV a ten minute version could be made using materials from the full version and sent to TV stations everywhere. I’ve noted some of the steps that I think will be required. They’re not necessarily in any particular order. Crowdsource a list of all benefit cuts, eligibility reductions, care and service cuts and the impact of all this. Start an awareness campaign on social media to get people involved. Ask people to submit short clips through Vine and YouTube telling their stories and what they expect to happen. Clips can be recorded with smartphones or webcams. Gather these clips under a hashtag on twitter. Raise funds through donations for travelling to record interviews. Interested parties meet to discuss content. Further meetings where appropriate in later steps. Follow up personal stories for better recordings. Create graphics and animations to explain the changes. Edit together a draft version of the film. Record narration of the changes. Meet up physically and make a final version of the film. This is all very much at the ideas stage, please comment with your views, suggestions, offers of help etc. Lets make this happen! Owen Jones confronted Iain Duncan Smith with the names of two people who have died as a result of the work capability assessment. He did not react well. 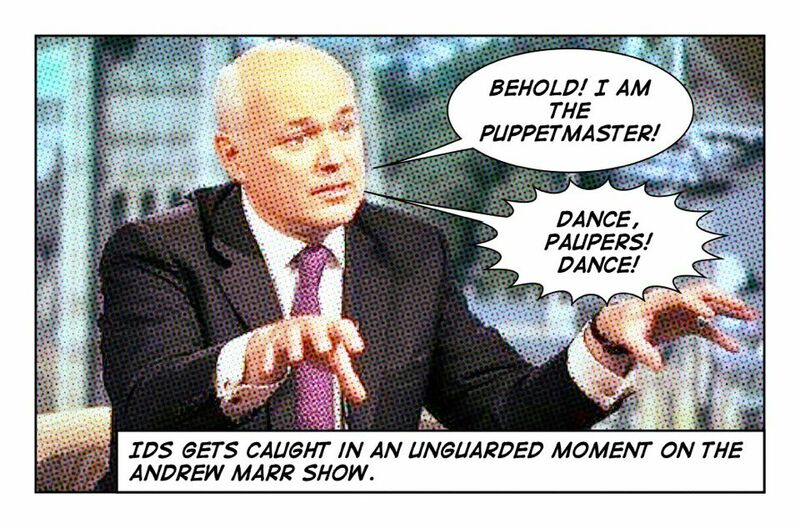 I urge you to watch this video of the last part of Question Time, particularly the last minute if you want to see what IDS is really like. Iain Duncan Smith is proud of getting people off benefits. Never mind that there is no work for them to go to even if they can, and that the way lives are being changed is by sending people further into poverty and homelessness. Not only that, but he thinks that being “parked on benefits” and left alone is a bad thing. Well those of us on permanent sickness and disability benefits do have hopes and aspirations. We hope to not have too much pain today and we aspire to getting the care that we need so that we can undertake something entertaining that isn’t lying in bed waiting to die. We probably don’t aspire to being a rich Tory, which is probably similar to being dead in the head of Iain Duncan Smith. As for nobody seeing sick people, now they are being reassessed so frequently that they are committing suicide. Winning an appeal at tribunal often leads to an immediate call to another assessment. Karen Sherlock: How many more disabled people will die frightened that their benefits will be taken away? The third independent review of the Work Capability Assessment [PDF] by Professor Harrington has been released today. I am not particularly impressed with it, particularly Harrington’s criticism of those who have campaigned against the current welfare reform. I don’t know what world Harrington inhabits but that “adverse media coverage” was brought about by relentless campaigning from those who are directly affected in horrendous ways – “representative groups” and the only “political points scoring” we’ve made has been nearly universally against all three main parties. We have had a very hard time getting people within those parties to see the problem at all. Calling for the DWP to get better PR is not the solution. Right in the foreward I was struck by his comments about tribunal judges. Harrington is calling for feedback from tribunal judges to the Atos assessors and the DWP decision makers over why they reached different decisions to those made by the DWP. However the comments that Robert Devereux DWP private secretary made before the Public Accounts Committee on the 19th appear to be directly quoting the paragraph above out of context and instead criticised the tribunal judges for reaching a different decision. His thought appears to be that if looking at the same evidence then the decision should also be the same, without considering that the original decision makers might have been wrong. What Devereux and Harrington both seem to have missed is that Atos and the DWP have often failed to look at the evidence at all and the face-to-face assessment is not likely to find anything that strays from the Lima computer system’s checklist. There have been many cases where Atos and DWP staff have refused to look at evidence from healthcare professionals or refused to wait for evidence, and many more cases where evidence has been lost in the system somewhere between health care professional and decision maker. The Work Capability Assessment (WCA) remains a valid concept for assessing benefit claimants’ eligibility for Employment and Support Allowance (ESA). Whilst the WCA continues to garner considerable – and sometimes, but not always, justifiable – criticism the Independent Reviewer has not seen or heard any compelling arguments or evidence that the whole system should be scrapped. Instead it needs to be made fairer and more effective by improving both the process and the technical descriptors used to assess eligibility. I know a lot of people would disagree with that, but I think this is a lost battle and the public will continue to support assessments in this way. I took a little more hope from his recognition that we do need change. A number of the major charities in this year’s call for evidence say that although they have seen some change for the better, it is disappointingly incomplete in coverage and depth. I agree with them. Changing such a large and complex process and such a controversial assessment takes time – it is happening. So far as the descriptors are concerned, progress has been positive but slow. We are close to a new and much improved set of provisions for cancer treatment. For the mental, intellectual and cognitive conditions descriptors and for the fluctuating condition descriptors, work is underway for a formal review of new proposals from a number of charities to compare them with the existing descriptors. This work will continue into 2013 and I have been asked to chair the expert independent steering group overseeing the quality and validity of the evidence-based review. It is important to wait for the results of this before rushing to conclusions about how to change the descriptors. We know from earlier this year that the DWP have been testing new descriptors and I hope that there will be progress on these so that serious conditions affecting ability to function which are currently missed will be noted in future. Also note in the paragraph above that Harrington is to continue working with the DWP on this aspect. I am concerned that cancer treatment has been singled out as needing special attention once again. 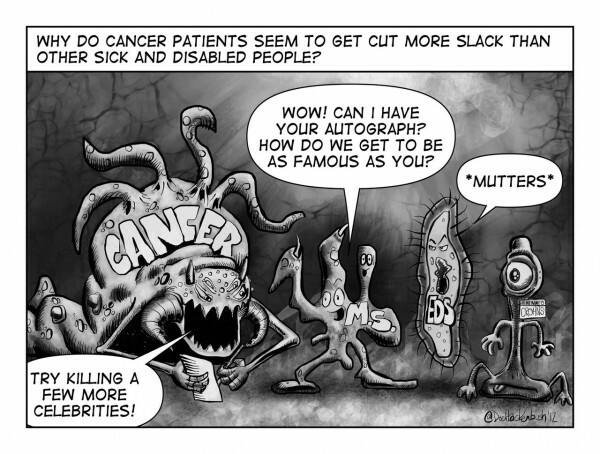 Cancer is very bad and unpleasant and everyone knows someone who has had it, that’s why it is politically dangerous to send patients on chemotherapy to work. 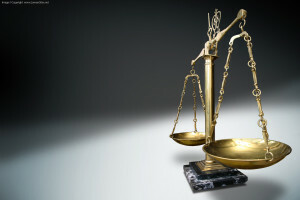 However many other conditions are equally serious and yet not so media-friendly and are therefore treated differently. The Work Capability Assessment is supposed to be about assessing the impact of the condition on ability to function, not what treatment is being received. Harrington made a number of recommendations to the DWP. I am pleased that the first is for decision makers to consider the need for further documentary evidence. Whether they will do this or not is another question but as I said before the gathering of evidence is a big problem. It is essential that all relevant medical and allied evidence about the claimant is available to the DWP Decision Maker at the earliest possible stage in the assessment process. If this can be achieved then Tribunals will be based on Judges and Medical Members considering the same body of evidence as the Decision Maker did. DWP Operations need to find an appropriate balance between better quality decisions that are carefully considered and ‘right first time’ and the achievement of appropriate benchmarks at a local level. Now I could be wrong here, but that looks very much like a target. The third recommendation is that the DWP should try to get more feedback from tribunals as to why decisions are overturned. This seems reasonable as it could affect change in the decisions made to start with. The fourth recommendation is that the DWP must highlight improvements, and be open about problems. As I said before, better PR for the DWP is not the answer. I’m open to hearing about improvements made but not if they are used to distract from problems that remain unsolved. As an antidote to this review I recommend that you look at The People’s Review of the Work Capability Assessment from We Are Spartacus. Also note that DWP statistics released yesterday [PDF] show that 53% of the people placed in the Support Group for ESA are put there without a Work Capability Assessment. I’ll leave you with this comment from Harrington. You’re damn right it can’t! What’s the difference between 1930s Germany and modern-day Britain? Before we start I would like to point out that I am not a historian and I am not a sociologist and as such I have done my best to present the information here as I understand it. With that out of the way, I’ll start with an overview of how disabled people were treated in Germany during WWII. A poster about how expensive disabled people are. The Aktion T4 programme ran in Germany from 1939 to 1945. 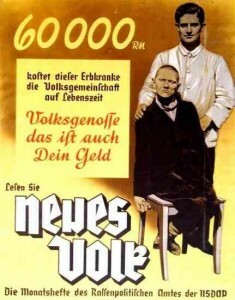 In the 1920s Alfred Hoche and Karl Binding, part of an extreme eugenics movement, advocated killing those who were judged to have “life unworthy of life.” In the 1930s there were huge cuts to state institutions causing overcrowding and Nazi propaganda emphasised the cost of caring for mentally ill and disabled people. In 1939 parents of disabled child Gerhard Kretschmar wrote to Hitler to ask him to permit their child to be killed. Hitler agreed and immediately set up a committee whose job was to organise more such murders – Aktion T4. When the war started parents were told that their mentally ill and physically disabled children were being sent to special treatments centres. In fact they were murdered without the knowledge of the parents. The programme was soon extended to adults, starting in Poland then in Germany. Throughout the programme Hitler knew that there would be huge opposition to such killing and so he never put his orders in writing. The one exception was a secret letter written to authorise the formation of the Aktion T4 programme, mainly because his justice minister would not cooperate without one. The programme operated in secrecy until it was too late for most people. 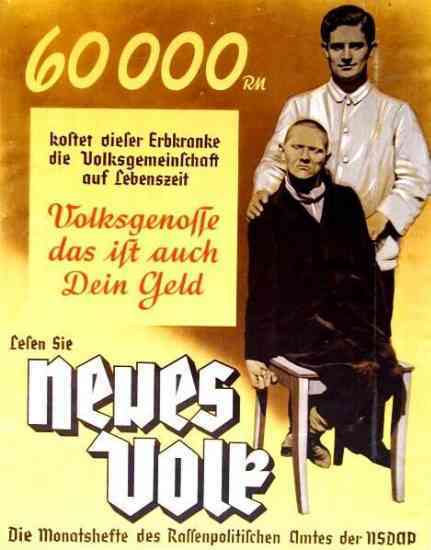 Under the programme at least 200,000 disabled people were murdered over six years, either through lethal medication, starvation or gas chambers. Now we jump forward to Britain today. The events I describe in the paragraph above are unthinkable. No government minister, no tabloid newspaper, no man in the street would advocate such things, right? That’s not quite true though. Most of the pieces are in place. We have propaganda pushing the idea that sick and disabled people are scroungers, workshy, lazy. This propaganda is coming from government ministers, their special advisers, and tabloids like the Daily Express, The Sun, the Daily Mail. Even broadsheets like the Times and the Telegraph have contributed. Such propaganda has even been raised by MPs in the Work and Pensions Select Committee and ministers told to stop. The propaganda is working too, with hate crimes against disabled people up in vast numbers. We have cuts to local authority care budgets, starting in Worcestershire, that mean anyone whose care costs more than sending them to an institution will lose some care. The politicians argue that it’s a choice because people can choose to move to a care home or to cut some of their care provision. But what to cut? Eating? Washing? Dressing? Using a toilet? We have already seen people lose in court after fighting to not have to wear a nappy. Adults are expected to soil themselves rather than get help to use a toilet. We have also seen the loss of the independent living fund. The net result is loss of care or institutionalising people. Most care homes are run by private companies and neglect does not seem uncommon. I think more abuse and neglect is likely especially when companies are cutting costs because they have underquoted better homes. We have sick and disabled people being judged as fit to work and told to claim job seeker’s allowance and look for work, and we have even more seriously sick and disabled people being placed in the Work Related Activity Group. Both groups are subject to The Work Programme where they are expected to undertake unpaid work experience for large companies, and government plans are to make such work placements of unlimited duration. Work makes you free. Under these plans anyone who is seen to not be cooperating with The Work Programme and other work related activities will see their benefit income slashed. Those on Job Seeker’s Allowance can have their entire allowance removed entirely for weeks, even six months. Those on Employment Support Allowance (e.g. too sick to work) will see three quarters of their allowance removed. Of course anyone who has been judged as fit to work or has been placed in the WRAG is expected to be capable of going on work placements even if their assessment was wrong and they are waiting a year for an appeal, and even if people are seriously harmed by trying to work. The result is that those who don’t destroy themselves trying to find jobs that don’t exist or going to endless work placements will instead not be able to afford food, clothes, fuel bills, rent and more. Many will be able to use food banks but some will not be physically able to get to them and food banks rely on charity from other people who are struggling too. Some government ministers make policy decisions without thinking about the consequences of what will happen in practice. Others are fully aware of what will happen and just don’t care. Either way, they are often covered by claiming that their policy in itself does not harm people, even though the flaws with implementation allow people to fall through the net and come to harm. Government ignore evidence. 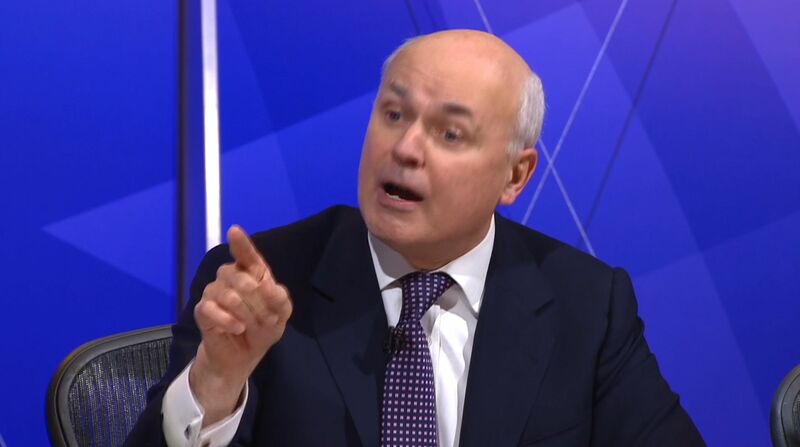 They dismiss statistics, they blame the previous government, they claim that processes are being sorted out now, they claim that any harm is the fault of the sick or disabled or unemployed individual. The Government are hiding behind Atos and A4e who are “just carrying out orders” but they way they carry out those orders makes things even worse. Government ministers have the same attitude as many other people in power – they can say “make it happen” and the minions do the dirty work. In 1930s Germany the government themselves ordered the rounding up and the killing of disabled people. In modern-day Britain the government can claim that it is not their fault, even that it should not happen, but private companies and the chasm of bureaucracy between various government departments are what kill people. Starvation, homelessness and neglect are what will kill people. The implementation is different and the scale is different but the attitude and the outcome are the same. 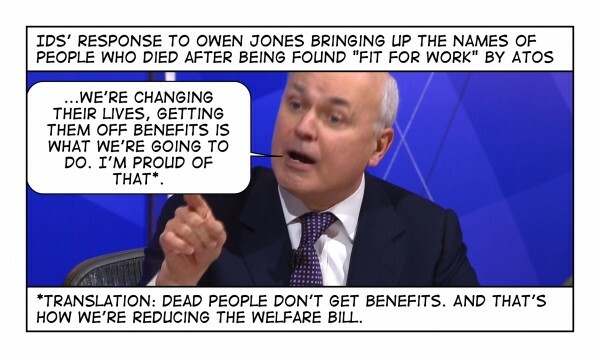 Author LatentexistencePosted on 6th September 2012 11th January 2013 Categories Politics, WelfareTags 1930s, ATOS, benefits, cuts, dla, esa, fear, nazi, pip, WCA, welfare, welfare reform bill, welfare state, workfare, wrb12 Comments on What’s the difference between 1930s Germany and modern-day Britain? The government are carrying out a consultation about Personal Independence Payments, known as PIP, which will replace DLA from next year. The consultation is our chance to tell the government what is wrong with PIP, and it could determine who qualifies for help and who does not. We Are Spartacus have come up with a survey which will help them write a group response to the consultation. Please help them by taking a few minutes to answer their survey. The survey assumes that you have seen the draft PIP descriptors, so if you have not please head to the We Are Spartacus website and have a look through the Unofficial Guide to PIP Consultation. Tonight Lord Best forwarded an amendment to the WRB, asking that the government did detailed research on the impacts of the bill so that if it does – as many fear – cause more harm than good it can be dealt with quickly. Lot’s of Lords spoke in support but eventually Lord Freud convinced the Peer that his amendment was not necessary and Lord Best withdrew. Now there will be no more ping-pong between the Lords and the Commons. The bill will become law. It just has to get Royal Assent, and that is a given. It’s so sad to think that all the amendments put forward to help those who are vulnerable have systematically been denied by a blinkered government waving ‘finacial priviliage’ at any hint of Lords opposition. Is this the end? No. The big fight is just beginning. Lawyers and Human Rights specialists are gearing up to fight it as are we. Remember the Poll Tax made law but was eventually defeated. We can work towards more protests and direct actions in the coming year. In a year and a bit we’ll have another general election and we can show the government exactly what we think of them. We’ll also have had our chance to get our stories out nationally by then. It’s important we try to make this a major area for Labour and other parties to focus on so they don’t forget the WRB should they come back into power. We can keep up the pressure there. And those are just the first things off the top of my head. Let’s no get too disheartened about this, there is still plenty more we can do. Mr Duncan Smith said he was “enormously proud” of the scheme and said its critics, who have branded it ‘slavery’, were indulging in “lies”. “In the other, armed with an unjustified sense of superiority and sporting an intellectual sneer, we find a commentating elite which seems determined to belittle and downgrade any opportunity for young people that doesn’t fit their pre-conceived notion of a ‘worthwhile job’,” the former Tory leader wrote in the Daily Mail. “Sadly, so much of this criticism, I fear, is intellectual snobbery. The implicit message behind these ill-considered attacks is that jobs in retail, such as those with supermarkets or on the High Street, are not real jobs that worthwhile people do. “How insulting and demeaning of the many thousands of people who already work in such jobs up and down the country! People are forced to work for these companies or face losing their benefits for several weeks or months. Paid employees are facing reduced hours and reduced job security in the face of free labour. People are being sent on placements inappropriate for the job they are likely to get because of their qualifications and experience. No one claimed that a job in a supermarket stacking shelves or washing floors is beneath them, and yet this is the angle that Iain Duncan Smith chose to attack. I suggest that supermarket shelf-stackers are somewhat more useful and less dangerous than Iain Duncan Smith too. But he got paid to do it! If you can’t win the argument, smear your opponents and call them “a commentating elite” and ignore their points in favour of answering a question that wasn’t asked. It is up to young people to decide, voluntarily, whether they wish to take part in the scheme, and they can pull out of their placement during the first week without sanction. Job seekers can face sanctions purely on the decision of the Job Centre advisor or private contractor hired to run these programmes. They MUST face sanctions under the rules if they pull out after the first week of the placement. This is why the scheme has been so successful. The fact is that 13 weeks after starting their placements, around 50 per cent of those taking part have either taken up permanent posts or have stopped claiming benefits. This statement is highly misleading. Only around a fifth of people who have worked for free on these placements has been given a job at the end of it. The rest have simply stopped claiming benefits, but have not necessarily found work. Many have simply become dependant on their parents, whether their parents have the income to cope with that or not. Let me be quite clear: this Government does not have a workfare programme. Workfare is an American term used to describe employment programmes which force all jobseekers to work at a certain point of their welfare claim — a practice which we do not consider to be effective. This is true, but also misleading. No programme in the UK is called “Workfare” however that is the name which all government work experience and placement schemes are collectively referred to as by opponents, and indeed, quite a lot of supporters too. In fact, the DWP report in 2008ahead of schemes launched by the government was titled “A comparative review of workfare programmes in the United States, Canada and Australia” and it also concluded that Workfare-like schemes were not only ineffective but actually reduced the chances of finding a job. Here, in Britain, it is true that we have a programme which can require claimants to undertake a short period of compulsory work if we do not believe they are engaging properly in the pursuit of employment. But the programme is carefully targeted and — importantly — it is entirely separate from the voluntary Work Experience scheme which I described above. This is again true but misleading. Compulsion is applied to a lot more than just The Work Programme – even to the work experience scheme after the first week, and before that if the Job Centre advisor so chooses. However, it is clear that retailers and employers are with the public on this, or at least afraid of the fallout from the public view. Several flagship participants in the scheme have dropped out in recent days. Waterstones, Sainsbury’s, TK Maxx, Superdrug – and several others are questioning the government over their forcing people to work for them. Tesco has issued a press release today announcing that young people sent for work experience in their stores will be offered pay throughout their placement and a job at the end of it if they prove effective workers – effectively a job with a probation period. – – To participate in the Government scheme, which protects their benefits for the duration of the four-week placement. Tesco has suggested to the Department of Work and Pensions that, to avoid any misunderstanding about the voluntary nature of the scheme, the risk of losing benefits that currently exists should be removed. – – Alternatively, to be paid by Tesco for the four-week placement, with a guaranteed permanent job at the end of it, provided they complete the placement satisfactorily. Tesco committed 3000 work placements under the Government’s work experience scheme. To date around 1500 have been delivered. We will offer the choice of paid work and the jobs guarantee to all of the remaining placements we will deliver under the scheme. 300 young people undertaking work experience with Tesco have already found work with us and we are confident that many more will through this approach.